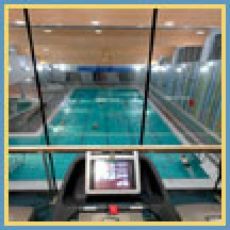 This Health & Leisure Centre opened in 2007 and is situated on Kit Ahern Road. It has a heated 20m pool, sauna, jacuzzi, gym and exercise rooms. The existence of a swimming pool in Ballybunion has been sought for decades. The complex is open all year round and offers yearly and part-time membership. ◊ Price for entry to the Leisure Centre is not separated out only normal advertised price of 18 euro is available to see at the Centre. ◊ Price is not available unless staying overnight in Ballybunion and is not available to walk in customers to the centre. ◊ Accommodation providers give guest on their own headed paper signed and dated with the words June Family Offer. (Complementary slips are perfect). The above state of the art equipment are the Excite Line from Techno Gym. They have integrated radio & TV, hand sensors, fast track control, program training & touch screen monitors. We also have a free weights area, smith's machine and adjustable Benches. We offer each member an indebt induction to the gym. A program can also be sought at any stage free of charge. This is pre booked at the reception. To avail of the special offer of staying in Ballybunion with the Leasure centre call or book today. Let BallybunionGuesthouse.com look after you folks in Ballybunion this holiday summer.